There is nothing quite like new bike day, is there? The hand wringing anticipation as you wait for the call from the bike shop that your bike is ready to go home with you. The simultaneously familiar and strange feeling of throwing a leg over a new bike and pedaling it home for the first time. This weekend, we added two new bikes to the flock – Salsa Warbirds. Warbird Tiagra in Orange and Army Green. The Warbirds are Salsa’s dedicated gravel racer and for some readers will seem like an unlikely departure for us (it doesn’t even have fender mounts!). But let me explain. Over the years, our interests and style of riding has changed over time. To paraphrase much wiser men/women than I: mutability is the only constant. Many will remember that we started with traditional fully loaded touring rigs, segued into lighter multi-modal touring with Bromptons, and for the last 3 years have been doing shorter trips with less overall gear on our Vayas. While not quite ultra light, we’ve learned to pare down quite a bit! 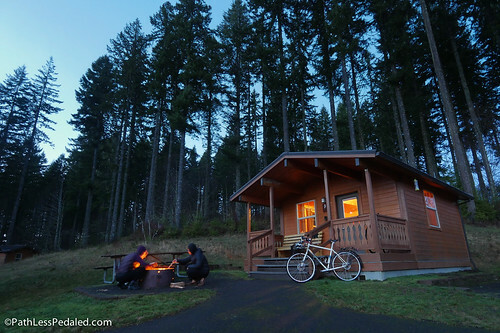 Check out our Gravel Getaway story. 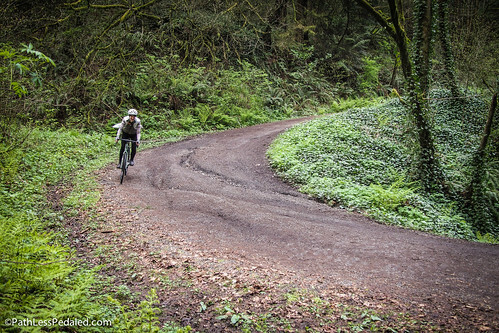 We’ve also started doing more road rides and venturing into gravel riding. 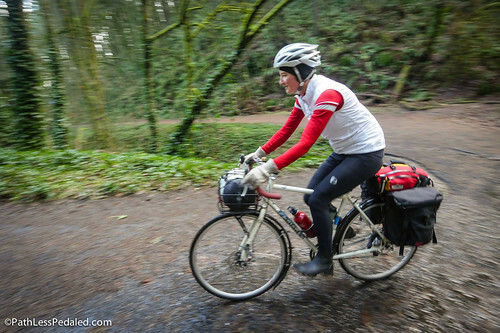 Fatbiking and bikepacking have exploded onto the scene, but since we choose to be car free in Portland, getting out to where those bikes really come to their own means a lot of pavement riding or navigating a Rube Goldberg puzzle of light rail and regional buses. This is where the Warbirds come in. They are a better fit with our preference for trips that originate from our doorstep. We plan to experiment with a rackless softbag/bikepacking system on the Warbirds for mixed terrain, multi-day tours. There are so many backroads to interesting destinations and classic mixed terrain routes from Portland that we haven’t really explored yet. 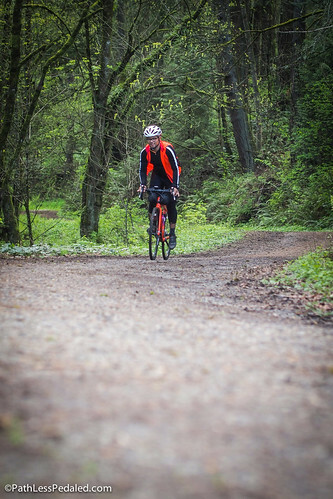 We’re also eying some gravel rides and events, for research purposes, of course :), to understand what this “new” kind of riding means in terms of bicycle tourism and rural communities. 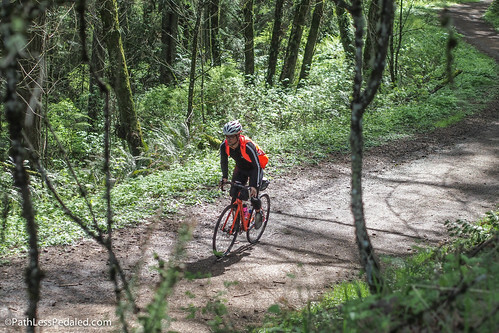 One of the rides we’re looking at in particular is put on by Bicycle Rides Northwest, which features 3 days of gravel riding out of a basecamp along an awesome flyfishing river! Of course, we could use the Vaya for a lot of this, but they are our daily drivers and loaded tourers. For more spirited gravel rides, we find ourselves constantly taking off the racks and then putting them on afterwards. I’m a bit weary that we’ll strip out a bolt one of these days so it’s great to have a dedicated rackless go-fast bike. Looking forward to more lightweight mixed terrain adventures. Enough of the why and more of the how’s it ride?! Just as a note, we’ve only put in a few short rides and are still dialing in the fit, so these are pretty early impressions. We both have the Tiagra versions of the Warbird which come in a glossy orange and a more muted “army green.” Orange is my favorite color and the orange on the new Warbird is sublime and reminiscent of the orange waterproof Field Notes notebooks. The army green has a matte finish and evokes a more utilitarian version of Bianchi’s Celeste. 46-34 chainrings make for a sensible “road” double. The bikes are outfitted with Tiagra throughout. The rear cassette is 12-30, fine for unloaded riding, but we might look at options to put in a 12-34 in the future. 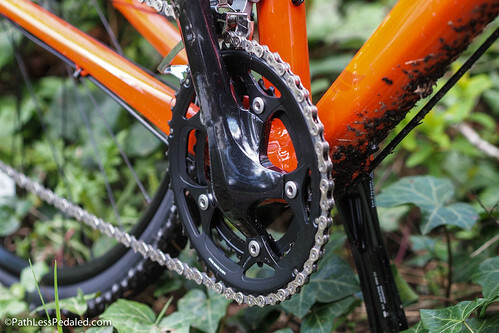 The crankset is a 46-34 cross crankset, which we actually quite like. The 46 is a sensible size chainring size for the kind of riding we do and lets us stay in the “big ring” a lot longer. The chainstays aren’t only pretty to look at. The handlebars are Salsa Cowbells, which we love and are on our Vayas. They have a very usable shallow drop and a bit of flair so they are pretty functional, even for cyclists that aren’t contortionists. The Warbirds came stock with WTB Silverados which many people like, but which we found a bit narrow for our anatomies, so Laura installed a Charge Ladle and I put on a 143mm Toupe harvested from another bike. As mentioned earlier, the Warbird has no eyelets for racks or fenders. For some, this will be a deal breaker. We knew about this limitation and since we have fully fendered Vayas, if the weather really got that wet out we’d have other options. 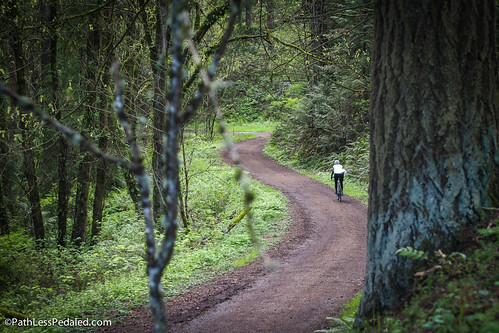 For our first ride we took them out to Forest Park, Portland’s local mixed terrain playground. The surface in Forest Park varies based on the amount of recent rain. When it is dry, there are some head rattling stretches with fist sized rocks. Just after a rain, you can get some muddy sections. The day we went, it was somewhere in the middle. Some of the rocky portions had been smoothed over with dirt and there were a few muddy patches but nothing too severe. The main road through the park is also generally climbing anywhere from a 2-3% to some 7-8% grade. The first thing we noticed immediately was how the bike seemed to dull the rough surface. That’s not to say that it magically made everything buttery smooth, but the bike was working to take the sting out of the ride. We plan to ride the route again with various tires to see how much is a function of the rubber (35mm Sammy Slicks) and how much is the function of the bike. Another very noticeable difference from the Vaya was the Warbird’s willingness to climb. The Warbird may dampen the bumps but is still stiff enough for the climb. The rear end of the bike felt a lot more taut and responsive to standing and seated efforts, due to the shorter and flattened chainstays. While not as responsive a climber as a pure-bred carbon roadie, it definitely had more get up and go than our Vaya and All-City Space Horse. The front end of the bike is mellow and predictable which is always welcome on bumpy road surfaces. Most interestingly is how well the bike descends on dirt, the mild mannered front end lends a lot of confidence on mixed terrain descents. The stable front end makes for a remarkably confident descender in mixed terrain. So far, in the short time we’ve ridden the Warbirds, the bikes are undeniably a blast to ride. If the Vayas are about going the distance, the Warbirds are about going fast. We’re looking forward to really dialing them in during the next few months and figuring out how to pack our gear without racks! So stay tuned! 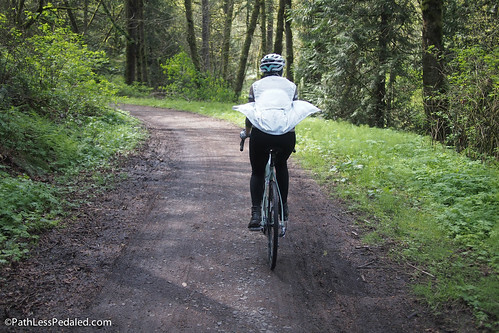 Though I know they are intended as a gravel race bike, I can’t wait to hear how they work with bags for light adventure touring. I use my Salsa Warbird 2 for everything! And they work great with a backpack and light touring or overnight trips! Salsa–I just don’t understand the no fender mount thing… I’m glad that my Fargo is older. im keen to hear what bag setup you arrive at. I have a similar bike setup with no eyelets. Pete – we are still figuring it out. Probably some combo of Revelate gear. What bags are you running? If going fast is one of your objectives you might find the 46×12 combo a bit low. 46×12 at 90 cadence is 26mph…at 80 cadence it is 24mph. Fast enough for us! You guys want to hit some dirt, I know some out my way. I met you briefly on the dirt road ride from Banks trailhead in February. I’ve got a couple routes I do, but more I need to connect. Would have ideally run a SRAM drive train. SRAM road shifters pair well with their mountain derailleurs and you can get a 36t working in the back no problem. Since its Shimano, might have to settle for 34t in the back. Russ – ahh, that makes sense. I’m buying a new bike soon for exploring high altitude, sustained paved+gravel climbs in Colorado. Endurance geometry and big tires are a must for me. A Warbird w SRAM drivetrain sounds perfect. However, it’s probably beyond my $2k ish budget. Vaya with SRAM is similarly expensive. I might end up settling for a less sporty AWOL Comp. 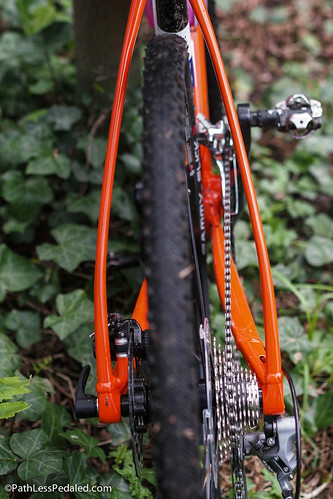 The stock version has a SRAM 34/36 low gear and can be cheaply modified to add a 40t or 42t rear cog. 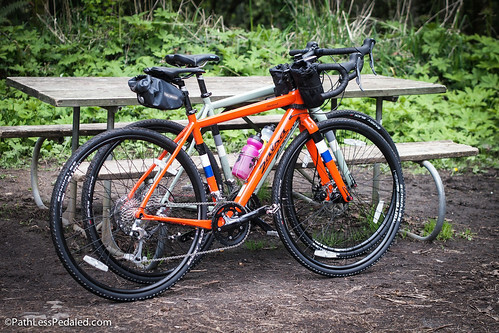 So you’ve got the Vaya (touring) and the Warbird (gravel), and the Space Horse got a mention. Is the Space Horse your pavement-only bike? Curious where it fits in. The Space Horse was a “go slightly faster” than the Vaya without racks steel bike. Rode it on some long day rides and at the Salem Gravel Grinder. It was sort of a stop gap bike before we got the Warbird. There is a bit more overlap in the stable now with the Warbird and Space Horse. Might turn the Space Horse into a rando bike at this point. What sizes are your frames? Russ’ is a 53, Laura’s is a 56.
i love this bike and in Bend, Or we have unlimited cool trails. Webcyclery, our local shop now rents demos and my husband and I are busy mapping rides on dirtyfreehub.com. So should you be on a bike vacation, give it a try. I love avoiding being in traffick … Don’t miss trying to scream so someone can hear me on single track mountain biking. Gravel is perfect for me! Thanks for the headsup on the site. We go to Bend pretty often and are itching to bring the Warbirds there! @David – you can run a Shimano 10-speed 11-36 tooth cassette and a 9-speed XT rear derailleur with those 10-speed Tiara shifters, crankset and chain. It will work fine. I just received my Warbird yesterday. I took it out this AM and was truly pleased. This bike handles awesome on gravel roads with the VR5 vibration reduction technology. I ride Surly bikes and currently own three of them (troll, disc trucker, and ECR). I love Surly bikes but I now have found the bike that I will use for long day rides and possibly some S24o’s. Salsa has really put some work into this bike and it shows in the details. thanks for this review. it’s really helpful and i’m interested to know your thoughts now that you’ve had the bikes a little longer. we are in MN and have made the decision to start riding. the trouble we’ve had is deciding what type of bike. the warbird is looking like it will be the most versatile for riding trails and we can still keep up with our road bike friends. Nice write up! Question. What is a rando bike? I love the specs on the warbird. Looking for a bike that can do occasional touring, occasional cyclocross races and just some dirt gravel tail trails. Would this bike for that all arounder? Could it pull a single wheel trailer for touring? Hi! I wonder if this warbird could double as my road bike for group rides (50 miles, 18 mph, road). If I put slicks on it, could I keep up with the carbon road bikes? Yes. 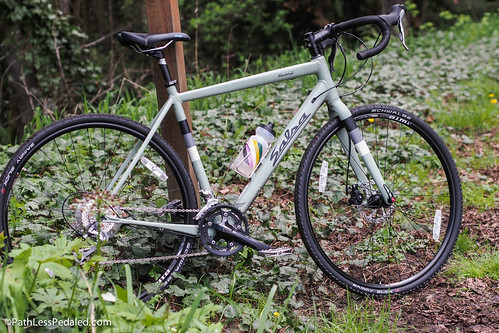 It is a great bike and would double well as a roadie bike.